The 2007 crop for this, our third release of Bere Barley, was grown on Orkney and supplied by the Agronomy Institute at Orkney College UHI, working with local farmers Duncan Cromarty at Richmond Villa on South Ronaldsay, Keith Hourston at Skelbister in Orphir and Magnus Spence from The Northfield on Burray. Bere is an ancient barley landrace. Discoveries of similar grains, in the Neolithic village of ‘Skara Brae’ on Orkney, reach back to the dawn of Scottish agriculture and civilisation, more than 4,500 years ago. It produces desperately low yields – 50% less than a modern crop – and the small, starch-rich grains have tested the mashmen, wreaking havoc with our precious Victorian machinery. 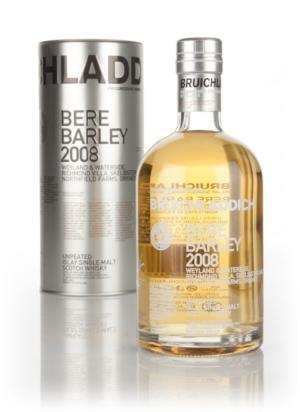 Distilled in early 2008 at Bruichladdich Distillery on the Isle of Islay, this Bere Barley has produced a single malt of quite singular character, ultimate originality and exceptional provenance. Elegant and sophisticated. The spirit is deceptively light concealing a depth of flavour rarely found. Instantly floral. Delicate but powerful. Honeysuckle, yellow gorse and heather rise from the glass coaxed by a splash of spring water. As you inhale, the ancient grain surrenders malt sweetness fused with cooked apple and ripe rear, all this swathed in rich oak offering vanilla, heather honey and lemon zest. Displaying the skill of slow distillation and craftsmanship that created it this single malt is harmonious in its complexity. The texture is that of honey, smooth and suave. Vanilla, brown sugar and zesty citrus stand tall as gentle waves of soft fruit apricot and peach are driven on by a Hebridean breeze filled with the scents of summer. Like a receding wave washes the sand clean your palate is refreshed by a spirit that is gentle and powerful, young and yet knowing. Sweet soft and floral, continually pulling you in to release its secrets, to touch this single malt to your lips is a beguiling experience long remembered. A superior spirit skilfully created that has age beyond its years. Many thanks to Bruichladdich Distillery for review sample. Thanks also to Steve at Somerset Whisky Blog and Tom at Toms Whisky Reviews for sharing. Another Bere barley expression, made from the ancestral Barley variety notoriously low yielding but hopefully full of plenty of flavour! I have tried several Bere whiskies now, most notably from Bruichladdich and Arran distilleries and they are usually very tasty and noticeably more mealy than whisky produced from modern high-yield barley varieties. Sweet honey, cereal barley, fruity; peach, apple, pear, kiwi, mango, grassy like hay, vanilla icing sugar, an almost meaty maltiness like marmite and honey-glazed gammon. Very enjoyable, I sampled this alongside Bruichladdich Organic Barley and Islay Barley expressions and found this one to be a lot meatier and mealy in its cereal barley nature than the other two expressions.